Football Fans is one of the few sports themed games that actually look at the fans, instead of focusing on those that play the sport. Playtech decided to do things differently in the case of this game, where you see things like fans, flag themed playing cards, air horns and beer. The quality of the game is decent enough, plus there are all the features to consider and which make it quite interesting. A total of 20 lines are provided by the game, but you choose as many as you want to have active on the 5 reels. As you spin the reels, among the regular symbols you will find wilds and scatters, with bonus games and free spins triggered by them. The best possible payout that can be won is worth $125,000. Whether you’re a fan of the design or not, there is no question about the quality of the features which are available, they do a pretty good job. 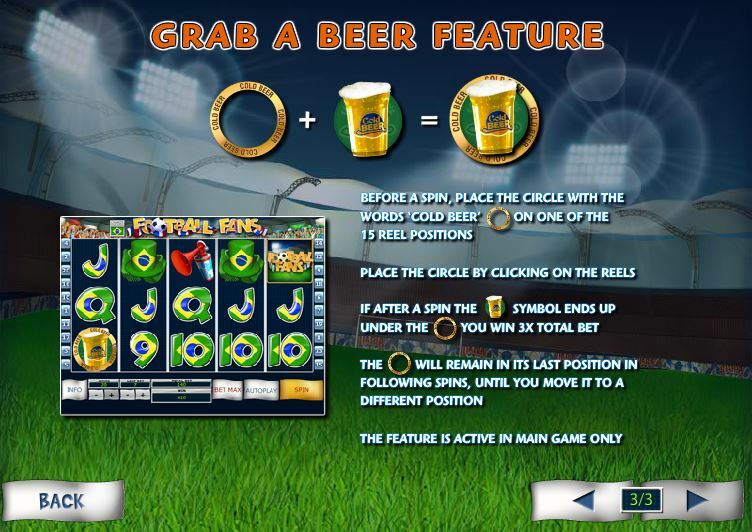 Starting with the free spins and their random wilds, the wild symbols and the Grab a Beer bonus, they manage to enhance the experience you get from this slot. The Football, with the word Wild written on it is the only one that can substitute for other symbols in the base game. You get it in random positions on the reels and when it lands on a line where the rest of the needed symbols are in place, it will take the same role as them and the combo forms. The substitution ability works on all the symbols, with the exception of the scattered Logo. From time to time, you will get multiple wilds together, forming combinations. When that happens, the prizes reach 5,000x for up to five symbols. A modern slot machine wouldn’t be complete without a scatter symbol, preferably one that offers both prizes and free spins. It’s exactly what you’re getting from the scatter of this game. 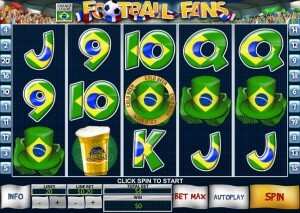 It shows off the Football Fans Logo and it awards prizes by being in sufficient locations in the same round. 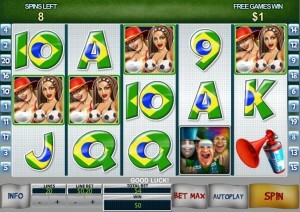 Whatever the position of the scatters is, there are prizes offered, between 1x and 100x the bet. 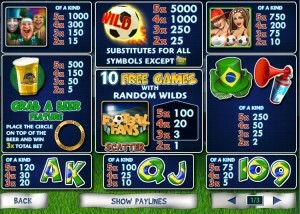 The free spins are also offered by the scatter symbol, at the same time as you get the prizes. You trigger 10 free spins here, with random wilds. 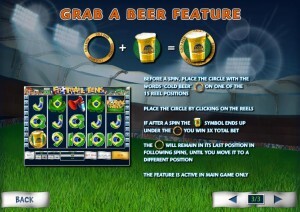 It’s a feature which can be retriggered, with the same requirements and the same number of spins. 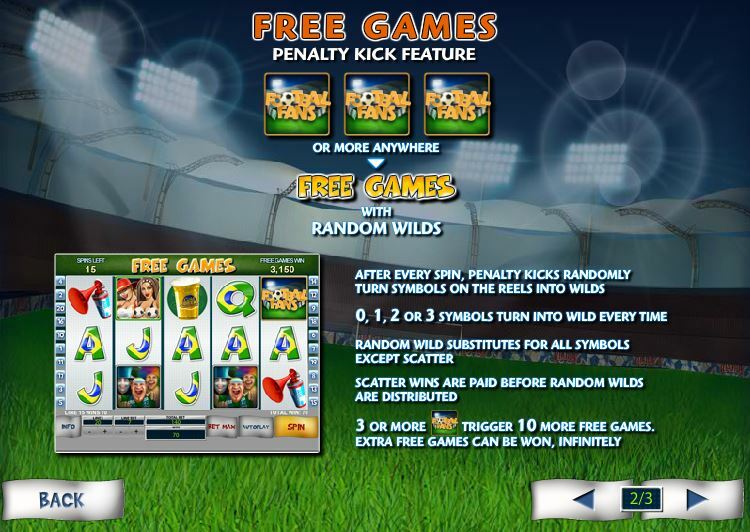 A penalty kick will occur after every spin, turning random symbols into wilds. Between 0 and 3 wilds are placed on the reels each round, with the help of this penalty kick feature. This is an especially fun feature, though it’s quite simple. There is a golden circle on the reels, with the words Cold Beer written on it. You can move this circle as you want, the default position being in the middle of the third reel. If a beer icon lands in the middle of that golden circle, you get a small prize, the equivalent of 3 times the bet. You are allowed to change anything you want about the bet, meaning that you can activate as many lines as you want and you can change the value of the line bet. Only one coin is used on each line. The line bet starts at $0.01 and stops at $25, allowing you to wager up to $500 on one spin. 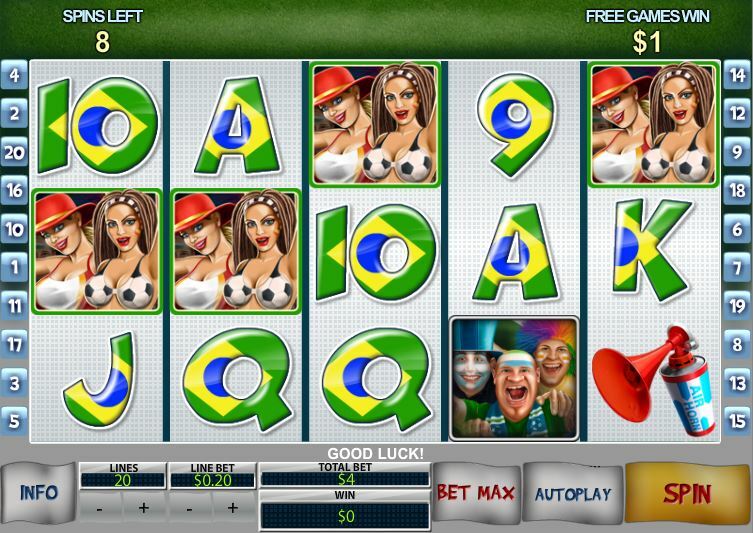 Since the game’s best combo promises you 5,000 coins, the value of the jackpot is $125,000. The design looks great whenever fans or other images related to the sport are concerned. You can see the stadium at the top, though you are shown only the stands filled with fans from both sides. You also have the option to change the color of the flag which is used by the game. The default is the Brazilian flag, but you can change it to one of the six others available. That flag will be used as the theme for the playing cards and the symbol with the hat/scarf. 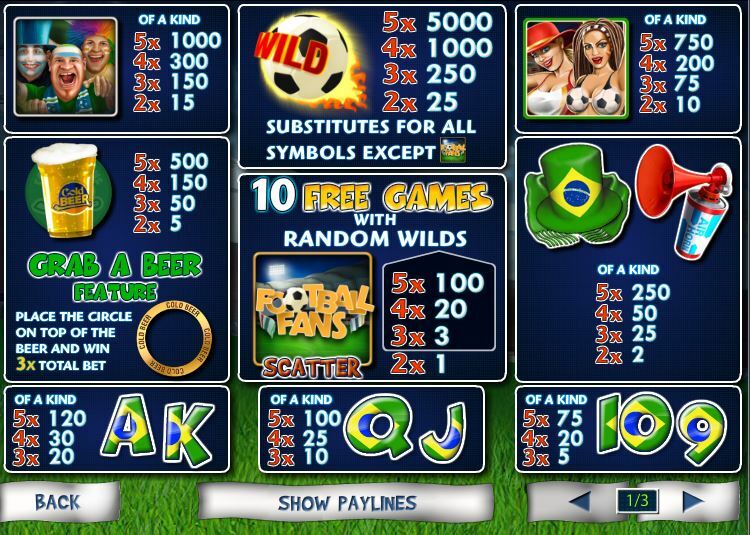 Symbols: Football (5,000 coins, wild), Football Fans Logo (100x total bet, scatter), Male Fans (1,000 coins), Female Fans (750 coins), Beer Glass (500 coins), Hat and scarf (250 coins), Air Horn (250 coins), Ace (120 coins), King (120 coins), Queen (100 coins), Jack (100 coins), 10 (75 coins) and 9 (75 coins). There are pros and cons here. On the plus side, the prizes are good and the features can be interesting, especially when you’re spinning the reels for free and taking advantage of random wilds. A downside would be the expensive wagers and the fact that the design could’ve used a bit more work, with fewer playing cards. 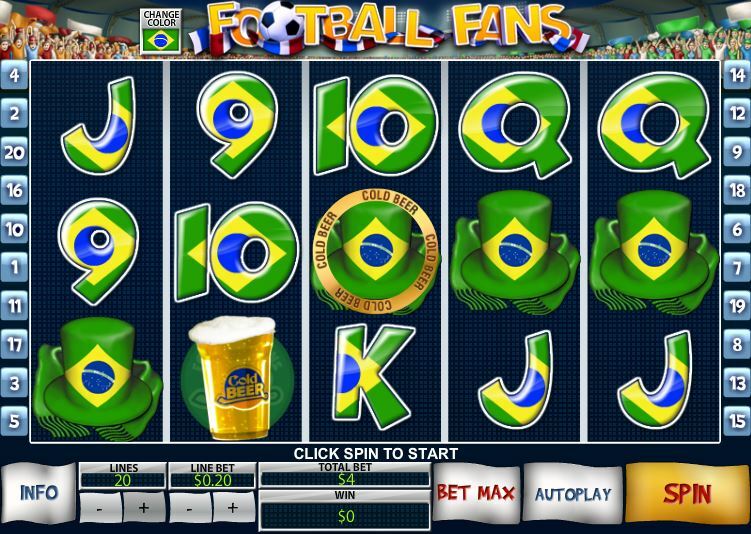 The Football Fans slot machine is offered through the Playtech platform, so if you want to play it for real or just to practice, look out for casinos that use it.